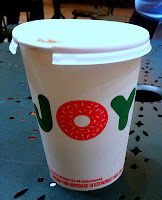 Over the past two years, I've written about my experiences trying hot chocolate all over Philadelphia. There are still dozens more to taste test, but none are more present in my weekday working life than the hot chocolate options at 30th Street Station. You have four choices at Philadelphia's landmark train station: Saxby's, Au Bon Pain, Cosi and Dunkin' Donuts. Here are my thoughts... You decide what's best for your next train trip. 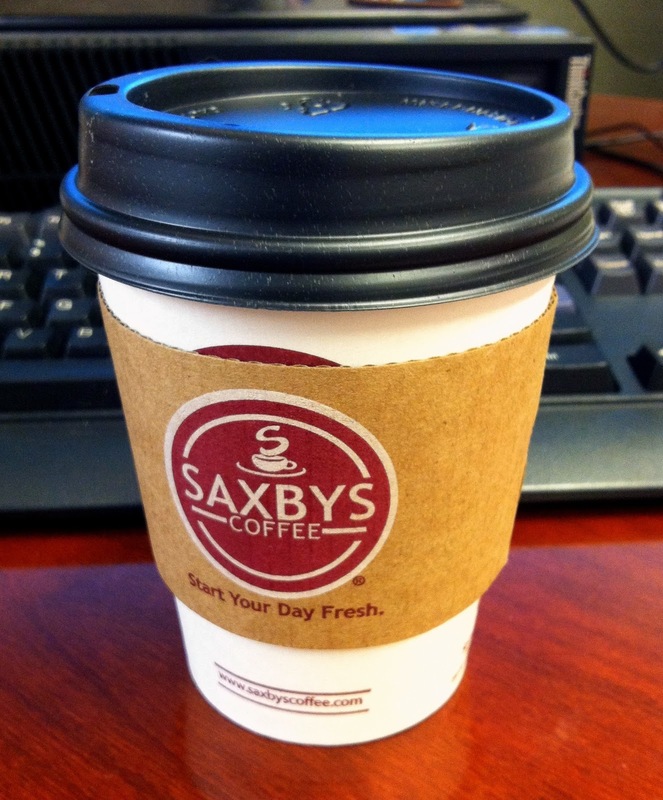 At Saxby's you'll pay $2.91 (tax included) for a small cup of cocoa. It's brewed right there in front of you so it takes a minute - maybe not the best option if you are running for a train. Thickness was average. In the to-go container it was drinkable right away but still hot enough to keep me happy. Around 8:15 - 8:30 am on weekdays, the line usually isn't long. 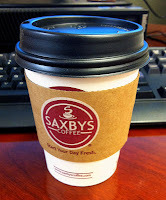 If you're counting, Saxby's small hot chocolate is listed on the website at 463 calories but on the sign it said 304 calories, so perhaps the former includes whipped cream? I am trying to find out. 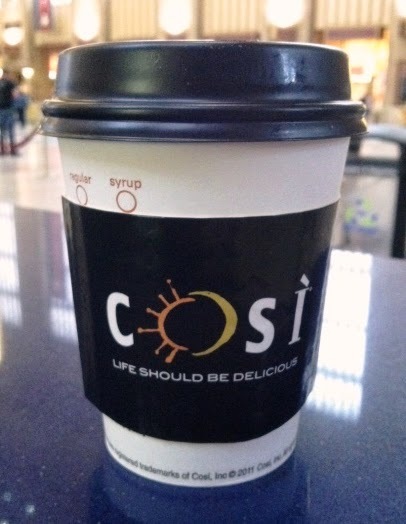 Cosi offers the most seating of any quick-serve coffee spots in 30th Street Station, so if you're looking to pop open the laptop or have a substantial bite to eat, it's your best bet. My hot chocolate came out nice and hot but didn't have a very potent chocolate flavor. A small runs $3.23 with tax and has 423 calories. The morning I went, service was very quick, but traditionally this Cosi's service seems to be a little chaotic so I wouldn't go in a rush. I have always been a fan of Cosi's "squagels" (square bagels) if you need breakfast, too. Hot chocolate at Au Bon Pain is not by the self-serve coffee pumps where you might look first. The one-size only (medium) hot chocolate is on the espresso menu hanging from the ceiling, so you have to go ask for it. 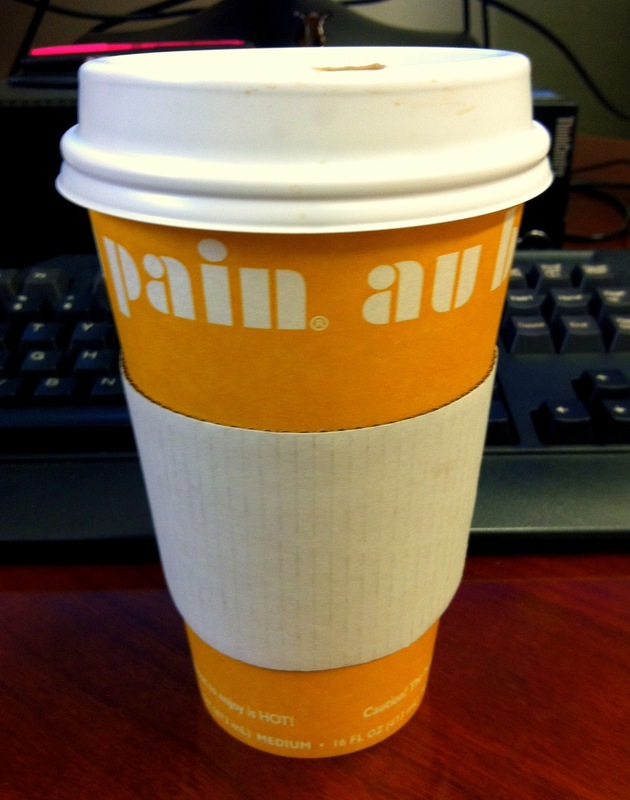 The people at Au Bon Pain went out of their way to help me find it when I was totally confused, so thank you to them. The medium runs $3.12 with tax (a good deal given the medium size) and is 460 calories. Again, it was made with some fancy whipping machine behind the counter but was more chocolately than Saxby's and most others I've had at similar shops. And of course, there is always a wall of delicious baked goodies calling your name. I've never denied being perfectly fine with mass-produced, watered down hot chocolate from Wawa, 7-11 or even a Swiss Miss packet. So to me Dunkin' Donuts also does the trick. The small is $1.61 with tax and certainly tinier in size than the other shops in 30th Street Station. But, honestly the volume of hot chocolate you get in this cup is just about all that ever stays hot - no matter where you get it from. It is enough for me and at that price, I'll be sticking with good ol' DD (and maybe a munchkin or two) this winter. Don't be scared by the long lines at either DD location in 30th St. (food area southeast of Amtrak and in the SEPTA wing). They move quickly. Also look out for former PA gov Ed Rendell, who I've seen waiting patiently in line before. Stay thirsty (and warm!) my friends. Have you ever heard of Sazon? its on 9th and spring garden. The guy makes his hot chocolate from scratch. Roast the beans himself.. its like nothing you've ever tasted.